This is the second leg of my 3 weeks holiday happening in May. Fukuoka is a mere 50 minutes’ flight from Busan, which is why I am combining a trip to Korea with a tour of Kyushu, southern Japan. Actually, the more important reason is that the open jaw flight (Singapore – Seoul, Fukuoka – Singapore) was being offered at the same promotional price by Vietnam Airlines (S$450) as booking a return flight. The downside to travelling on Vietnam Airlines is having to transit in Vietnam, which stretches 5 hours on my way to Seoul, but for the return flight, i specifically chose the longest transit time available – 21 hours, so i’ll have the chance to check out Hanoi. I’ll definitely do the overnight transit in Vietnam again if i fly with Vietnam Airlines in the future, for the food. 8.5 days probably sounds like a very short time to most people for going around Kyushu, and within this time frame, i’m actually going to cover Yakushima as well (pictured above), an island south of Kyushu (35 minutes flight time or almost 3 hours by ferry from Kagoshima). It is one among the most highly rated attractions in all of Japan (a UNESCO World Heritage Site, no less), so i’m making it a point to get there despite the trouble. Kyushu is relatively small compared to Korea and Honshu, so the distances are more manageable. I’m choosing to fly from Yakushima directly to Fukuoka, which saves me more than half a day if i travelled on land instead, and i think it is worthwhile despite the slightly higher cost. By the way, only Japan Airlines operates flights to/from Yakushima, and there is hardly any discount on the fare for such an exclusive destination, but you should do advanced reservations/purchase of the tickets anyway (more than 75 days ahead) to secure the lowest possible fare. Day 1 – Afternoon arrival, take Shinkansen to Nagasaki. Not much time for anything else except making a brief stop at dinner at Meganebashi before dinner at Oosakaya which specializes in beef. I read somewhere that Kobe beef is actually from Nagasaki. Not sure how true it is, but savouring beef is almost the whole point of going to Japan. Day 2 – Despite the popularity of Gunkanjima (Hashima Island), i have decided to give it a miss, since there is a very high chance of having the tour cancelled due to bad weather. Also, there is little that the tour allows one to see aboard the island itself for safety reasons, so i have a strong feeling it will be a disappointment. I suppose a visit to Nagasaki wouldn’t be complete without going to the Peace Park, which commemorates the incident of the atomic bomb that fell on Nagasaki. Lunch will be at Kouzanrou, to sample the famed Chinese style dishes Champon and Sara Udon. Next up is a visit to Glover Garden and Oura church, then tea at Bunmeido Sohoten, which is famous for their portugese style cake Castello. Thereafter, a visit to Mount Inasa to take in the night view of the city, and dinner at a random place. Day 3 – Pick up rental car and drive to Yufuin. Lunch at Koshikiteuchisobaizumi, which is just next to Kinrin lake. The other attractions at Yufuin are Yonotsubo Kaido main street and Yufuin Floral Village, which are littered with Japanese style cutesy things. I guess a major part of the enjoyment of being in Japan is to be immersed in the unique Japanesque atmosphere. Dinner will be claypot rice (the first time I have encountered these in Japan) at Yufumabushishin. Day 4 – After breakfast at Saboutenjousajiki, head to Kurokawa Onsen, a traditional onsen town planted in natural surroundings. It is a little challenging for us, with young kids, to go onsen hopping, which is what people do when they’re here, but we can probably visit one or two, and take a dip in those of the ryokan we are staying in. Day 5 – There are quite a few attractions around the central region of Kyushu, the most notable of which is Mount Aso, an active volcano, which erupted over the past 2 years and as recent as last October, resulting in it being completely closed to visitors. It is unlikely i will be able to see the crater in May, in-lieu of which i will be going to Shirakawa Suigen, a pretty stream with a nice garden built around it, along with the Daikanbo Peak and Kusasenrigahama which are along the way and near Mount Aso anyway. Lunch choices are plentiful around Aso, and i have settled on Kamado. Food does tend to be cheaper at the more rural areas, which is why i would go for Kaiseki. The day ends with a 3 hours drive to Kirishima where i will be staying just so that i am near to the airport. Zabonramen happens to be along the way (just next to the airport in fact), a perfect choice for dinner (while in Japan, i’m torn between having grilled beef or Ramen). Day 6 – Flight to Yakushima. Pick up rental car and visit Shiratani Unsuikyo straight away, provided the weather is good. Day 7 – Drive around (literally) the island. 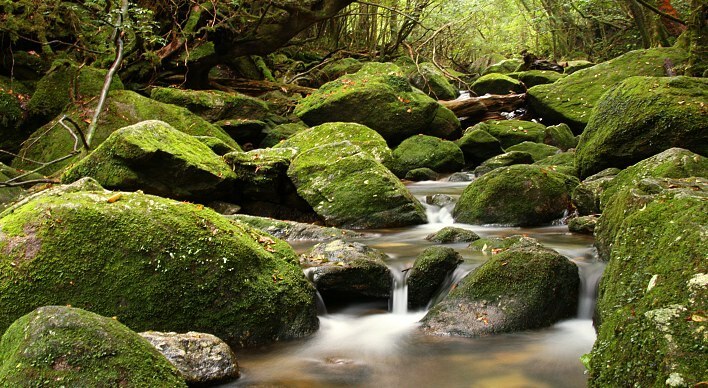 The other attractions on Yakushima i will want to see are Yakusugi Land and Okonotaki Waterfall. Day 8 – Flight to Fukuoka. Go on shopping spree at Tenjin Chikagai, the underground mall. Ramen for dinner at Mengekijo Genei. I chose this over Ichiran Ramen since i wasn’t particularly impressed when i sampled their Ramen in Tokyo. Day 9 – Visit Nishijin shopping district. Lunch at Sushiryuu. This is likely the only Sushi meal i will have on the trip, since Sushi is usually very costly, but Japan is truly the only place in the world where one can sample REAL sushi. Anyway, few Sushi places offer more than 10 seats, and it is particularly difficult for us, with young kids, to dine in a five-seater restaurant. After lunch, we continue our loitering at Canal City (i might just, probably will try Ichiran here, and definitely chill in a cafe), finally ending the day with dinner at a Yatai. Day 10 – Early morning flight out.